A man has taken to social media to narrate how he saved his family from kidnappers just moments after they were abducted. 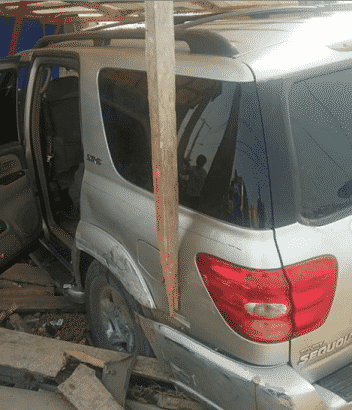 In his narration, he mentioned that his wife was driving ahead of him on their way from a church program when she was waylaid by the kidnappers. He gave them a pursuit and was able to crash his car into theirs before saving his family members. IF YOU’RE READING THIS, chances are that you’ve at least considered applying to law school and have probably realized that the process is a little more complex than you had originally thought. Naturally, many people will seek advice from a counselor, friend, family member or any other source they come across. While getting some help is generally a good idea, the law school application process is far from simple and is ever evolving. Someone who hasn’t been in the field for a while, like your mom who graduated from law school 25 years ago, or isn’t making an effort to stay up to date with all of the developments, such as a school adviser whose job description isn’t specifically focused on law schools, might provide you with some bad advice. Here is some of the inaccurate – if not downright awful – advice that applicants say they’ve received. The implications of taking wrong advice here cannot be understated. The decision to retake the LSAT involves a lot of factors, from practice test scores to timing and price, and basing those on a wrong assumption could lead to disastrous consequences, hurting your chances instead of helping them. Schools barely read the personal statement – it’s all about the scores. Let’s not sugarcoat it: Grades matter a lot. If your grades fall well outside a school’s typical range, admissions officials may not even consider your application. Admissions officials will read your personal statement, and more importantly, will read between the lines to spot attributes like laziness or lack of motivation. Your grades may get you through the door, but your personal statement is what will seal the deal. An applicant who has great scores, all well within the range for the target law schools, could still find it difficult to get in. Bad personal statements – full of half sentences, making no connection between paragraphs, conveying nothing about why you want to go to law school – can keep you out no matter how strong your scores are. You don’t need to prepare for law school interviews. This one is sort of true. Law school interviews – especially compared with their business and medical school counterparts – are typically informal and fairly short. However, don’t mistake the laid-back vibe, because the main purpose is still to decide whether you’re the type of student the school wants to join its student body. If you show up unprepared – have no questions about the schools, unable to answer simple questions like “why this school” or clearly have no idea of some of the school’s strengths or programs – it will become evident, and quickly. And while it’s rare for a fringe candidate to break through thanks to the interview, many applicants have been denied admission because of interview mistakes. Treat the law school interview just like an interview for the job of your dreams. There’s only one path into law school. People subscribe to the idea of there being a certain type of law student. This person is often a political science or philosophy major, debate team participant and has summer internships at law firms or political offices. But the last thing law schools want is a cookie-cutter student body. There have been instances in which law schools take premed students, members of rock bands and generally people who have done nothing to prepare for their law school application in the traditional sense because they didn’t decide to apply until their senior year. Much more important than being on a model U.N. ambassador is being a good student, crafting a great personal statement and conveying your motivation for going to law school. Schools are much more interested in how you’ll preform in school and as a lawyer than the number of philosophy classes you took. Take any sweeping statements about applying to law school with a grain of salt. People telling you you’ll never get in likely don’t know much about the process. Do some research so you can synthesize facts from different sources and decide for yourself what is more likely to be true. Leaning on others is fine, but trusting them blindly could come back to haunt you.